All stone surfaces are absorbent and as such can stain. Because of their absorbency even general dirt and grime ground into the surface can penetrate and become harder to remove. If there is a bad spill (oil, spray tan, food colouring etc) it can penetrate very deeply into the stone, to the point that it might not be able to be removed. Stone sealing with a high quality penetrating sealer will reduce the stone’s absorbency. This will stop spills from instantly staining, as well as making the stone easier to clean. It also stops bad spills from penetrating deeply, so even if they do leave a mark it is much higher on the stones surface and therefore easier to remove. Stone sealers are known as penetrating sealers, as they sit inside the stone (not on the surface) and do not change the slip or look of the stone. For advice on stone sealing call us on 0800 754 783 or fill in the form at the bottom of this page. 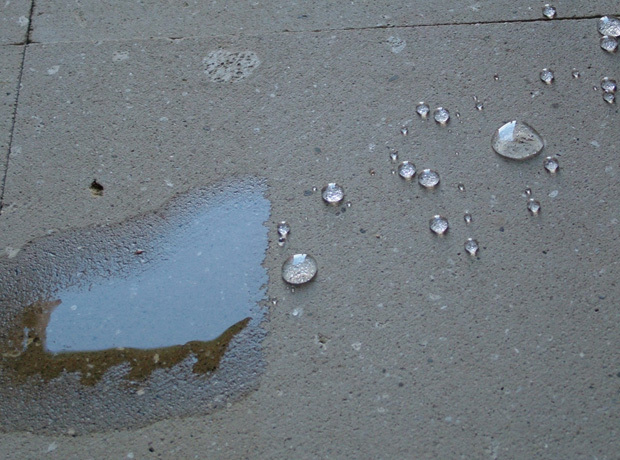 Mould is one of the more common issues with absorbent stones in an outdoor location, especially sandstone and limestone. Mould only grows from moisture, so by sealing the stone to reduce moisture intake and speed the drying process you can reduce mould and algae growth. In New Zealand conditions sealing does not stop it completely, especially in areas that are not exposed directly to the sun, or areas where water pools. Sealing in conjunction with preventative mould inhibitors is the best way to stop mould growth. Which stone sealer? Solvent or water based? There is often misinformation in the industry about solvent vs water based sealers, with opinions being offered on one type being more effective than the other. The solvent or water is simply the carrying mechanism for the active ingredients in the sealer, and actually evaporates away over time, so in our experience it is not right to say one type is better than the other. Generally you can differentiate between the two by considering that water based sealers are better at carrying the sealer into more absorbent stones, and solvent based sealers are better at carrying the sealer into denser stones. Stone Cleaning before Stone Sealing – always! When Slique apply a stone sealer we always make sure that the stone has been properly cleaned first. Even on brand new stone it is very important that it is cleaned to remove contamination from the stone’s pores to allow the sealer to bond properly into the stone.